Spring has officially arrived, the dogwoods and redbuds are blooming, and everything is pointing to new life. What an exciting time of year. It’s time once again for our annual missionary orientation and commissioning of the new missionaries serving in Kentucky. The orientation is a time for the missionaries to learn about the Kentucky Baptist Convention, the Cooperative Program, Eliza Broadus State Missions and many resources and support available to them. This time of networking is most valuable. Sixteen men and women that have sensed God’s call to serve in ministries across our state will be commissioned at the Kentucky Woman’s Missionary Union Annual Meeting and Missions Celebration on Friday, April 5th, at First Baptist Church, Bowling Green. Chris & Becky Baird, Director and Secretary/Treasurer for the Ohio County Food Pantry in Hartford. Jill Boddy, Office Administrator with HR Ministries in Princeton. Gail Boling, Serving at the Daviess-McLean Association’s Baptist Center in Owensboro. Dean & Melissa Branscum, Directors of Living Water Clothes Closet in Eubank. Tim & Joyce Burdon, Chaplain with Retriever Hunt Test Ministry and Women’s Ministry Leader in Marion. Sheila Cobb, Serving at Daviess-McLean Association’s Baptist Center in Bowling Green . Hilton & Barbara Duncan, Directors of Integrated Community Ministries in Stearns. Annette Robinson, Food Coordinator for Blood River Association’s Bags of Hope Food Pantry and Clothes Closet in Hardin. Lee Rust, Women’s Evangelist & Prison Ministry for Female Inmates with Freedom Forever Ministries in Paducah. David Thomas, Serving with Mission Hope for Kids in Elizabethtown. Daniel & Alice Tarnagda, Directors of Refuge Bowling Green. We want to extend a special invitation for you to join us for this special commissioning service where you can meet the missionaries and pledge your support for them. The 2019 Kentucky Missionary of the Year will also be recognized at the service. For more information, and to register for the Kentucky WMU Annual Meeting and Missions Celebration go to http://www.kywmu.org/annualmeeting. Acts is a book about the advancement of the gospel (through the birthing of churches) as the Holy Spirit comes to dwell in the lives of Jesus followers. In fact, the Holy Spirit takes would-be cowards and transforms them into lion-hearted witnesses for Jesus. For example, Peter preaches his second sermon at the temple area in Acts 3. Chapter 4 describes Peter and John being arrested for preaching the gospel. Peter and John make it clear to the religious leaders who had arrested them that there is salvation in no one else but Jesus (Acts 4:12). In the midst of hostility, Peter and John demonstrate gospel boldness. The religious leaders are surprised by the confidence of Peter and John because they were uneducated men. They further recognize that these two men had been with Jesus (Acts 4:13). In order to squelch the boldness of Peter and John, the religious leaders threaten them to speak no more about Jesus (Acts 4:17). You can imagine them being told that if they continue with their message, then they will do to them what was done to Jesus. Instead of cowering to the threat, Peter and John reply that they cannot help but speak about what they have seen and heard (Acts 4:20). In other words, we cannot keep silent; we must not keep silent. They are threatened again and released. Peter and John gather back with the church and report all that had happened (Acts 4:23). Peter’s and John’s gospel boldness comes through their confidence in a sovereign God (Acts 4:27-28). Just as God was in sovereign control over the death of Jesus, He is also in charge of their lives. Thus, gospel boldness is rooted not in ourselves, but in someone else. They pray, not for deliverance per say, but for boldness to proclaim the gospel more (Acts 4:29). While we might think that their prayer would revolve around asking for a way out, they actually pray for boldness in the midst of hostility. The gospel spreads from Jerusalem and beyond as the church prays, the Spirit fills, and the believers are emboldened. Why such a change from chapter 1 where the disciples are locked up in an upper room? Well, it’s really quite simple. Jesus was dead, but now He is alive . . . and they knew it. Jesus left them in order that He might send another Comforter who would fill them with power (John 14; Acts 1:8). Still yet, the disciples really believed that Jesus is the only way to be saved. That means any other way besides through Jesus alone is no way at all. They were gripped by this truth! They lived, breathed, slept and ate this truth. Men and women, boys and girls are eternally lost without Jesus. Whether as an individual in a remote tribe in Indonesia who mixes animism with Islam or a cultural Christian in suburban Kentucky or a postmodern living in a mega city, all are lost who do not forsake their sin and trust in Jesus alone for salvation. Ultimately, to be unreached is to not know Jesus as Savior and Lord. Peter and John were gripped by the truth that Jesus alone saves. They lived their lives seeking to make Him know, even if it cost them theirs. May we, too, be gripped by the truth that Jesus alone saves and pray for gospel boldness to reach the unreached. At the beginning of the month my blog was on Missions at Home and ways to participate in missions short-term, mid-term and long-term in Kentucky. A couple of other ways to be involved in “missions at home” is through the interSEED prayer calendar and the Adopt-a-Missionary program. Let’s look at how these work and where to find information about them. How could God work through our missionaries and church planters if we better supported them through strategic intercession? The interSEED monthly prayer calendar is a resource for Kentucky Baptists to support missionaries and church planters serving in Kentucky. These monthly prayer calendars encourage believers to pray for them on their birthdays. Each month you can go to www.kybaptist.org/interseed and download the prayer calendar. The calendar will show the birthdays in that month and where the missionaries and church planters are serving. Most of them will tell you that prayer is their number one need and you can be a part of their ministry through prayer. To better personalize your prayer for the missionaries go to www.kybpatist.org/missionaries and see a picture of the missionary and a description of their ministry. I know they will be so meaningful for the missionaries and for yourself. Do you want to “get to know” a missionary? Missionaries are not orphans, but adoption is a beautiful word that helps describe the strong relationship between missionaries and the churches and friends who pray and encourage them in their ministries. The church at Antioch, in a sense, adopted Paul and Barnabas as special messengers of the gospel to Asia and Europe (Acts 13:1-3). A heightened awareness of mission opportunities. The adopted missionary will benefit greatly from the prayer support, encouraging phone calls, emails, cards, visits and care packages they receive from their adoptive church. 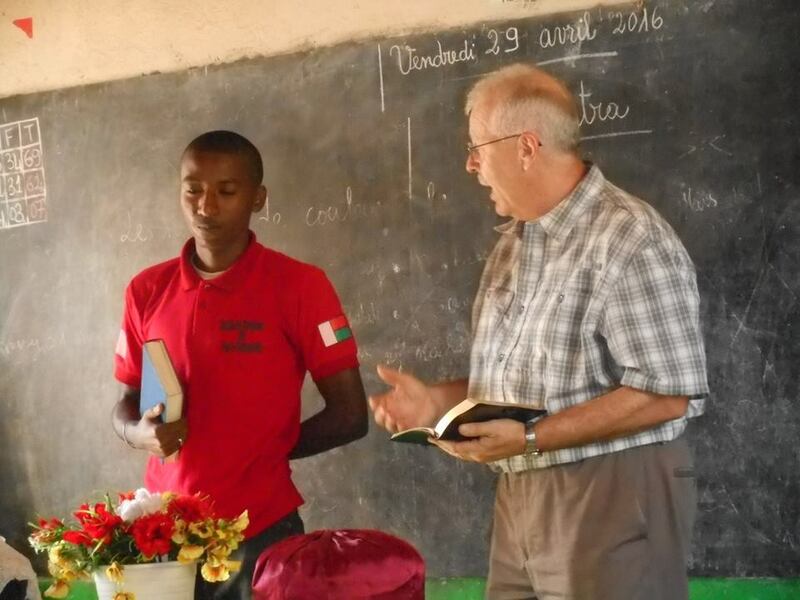 Sending mission teams to help with projects and resource needs are also a huge help and, opportunities to visit and speak at the adopting church will be greatly welcomed by the missionary. Check out the Adopt-a-Missionary program at http://www.kybaptist.org/adopt-a-missionary,1477 and consider adopting a Kentucky missionary. For more information on interSEED and the Adopt-a-Missionary program contact the Kentucky Baptist Convention Missions Mobilization Team at [email protected]. May you have a blessed 2019 as you connect with missions in Kentucky! !